A great new basket! The cherry base sports a carved design of a circle of stars. 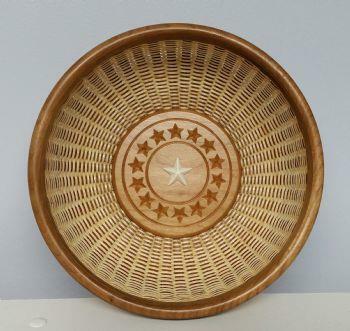 The center of the basket has a carved bone star. The basket is woven in the traditional Nantucket style and is signed and dated by Lisa Bessette. This basket is available in 2 sizes - an 8 inch round and a 10 in round size.